BLITZ LEARNING really helped me prepare for the SAT's. The Core helped me memorize many synonyms of advanced words which helped me kill the essay and sentence completion section of the SAT. The practice questions were helpful because they were modified from old tests and mirrored what would be on the real test. Also, the game section made the learning that much easier and fun. I highly recommend using this site if you want to vastly raise your score. Thanks Blitzlearning! You’ve been so helpful! BLITZ LEARNING은 제가 SAT를 준비하는 데 있어 정말 많은 도움이 되었습니다. CORE가 차원 높은 많은 동의어를 기억할 수 있게 해주어 제가 SAT의 서술문제와 문장완성 섹션을 박살낼 수 있었고, 연습문제는 기존의 시험문제를 수정하여, 실제 시험을 반영하였기에 큰 도움이 되었습니다. 또한, BLITZ LEARNING의 게임은 쉽고 재미있게 공부할 수 있도록 해주었습니다. 만약 SAT점수를 크게 올리고 싶으시다면, 저는 이 사이트를 사용해보실 것을 강추합니다.블리츠러닝 감사합니다! 많은 도움 받았습니다. I killed the SAT. I did so well on the reading section because every single word in the sentence completion section came out in the CORES and ESSENTIALS. When I first encountered the CORE and ESSENTIALS in BLITZ LEARNING, I felt that there weren’t enough words because I was brainwashed by Korean academies to think that quantity = quality. However, BLITZ LEARNING cleverly uses a synonym system so you end up memorizing multiple synonyms as definitions per word. 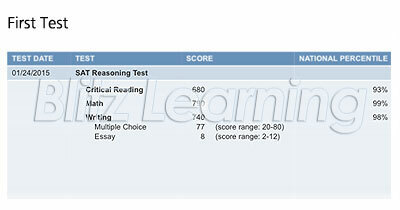 I know that the system is effective because I only memorized like half of the synonyms and still did well on the SAT. 전 BLITZ LEARNING의 도움으로 SAT를 정복할 수 있었습니다. BLITZ LEARNING에서 외웠던 수많은 영어단어가 SAT시험의 리딩섹션에 다 나와 고득점을 얻을 수 있었습니다. 처음 BLITZ LEARNING을 접하였을 때 영어단어의 양이 상당히 부족하다고 느꼈습니다. 다른 한국 학원들은 “양이 곧 질이다” 라고 학생들에게 세뇌시켜왔기 때문이죠. 그러나 BLITZ LEARNING은 그렇지 않습니다. 동의어 시스템을 학생들이 쓰게끔 하고있기 때문이죠. 상당히 많은 영어단어들이 동의어를 갖고 있는데 전 BLITZ LEARNING이 갖고 있는 동의어 중 반만 외웠음에도 불구하고 시험에서 아주 좋은 성과를 이루어 냈습니다. The numerous features of BLITZ LEARNING amplified my abilities to the fullest in a relatively short period of time. I found the practice features to be particularly helpful because it allowed me to focus on my weaknesses. BLITZ LEARNING이 가지고 있는 다양한 시스템들은 저의 공부능력을 최고치까지 끌어 올려주었습니다. 전 BLITZ LEARNING의 연습기능으로부터 많은 도움을 받을 수 있었습니다. 이 연습기능은 학생들의 취약점을 정확히 알려줄 뿐 아니라, 그 취약점들을 언제든지 보완할 수 있게 도와주기 때문이죠. I cannot emphasize enough how efficient and helpful the BLITZ LEARNING’s features are. My SAT scores weren’t that great before attending this academy. 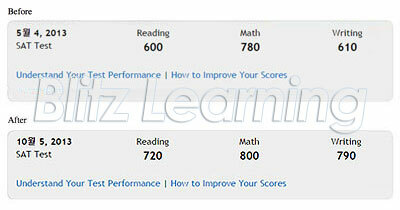 I memorized over 3000 vocabularies and solved hundreds of questions, yet my scores did not show much improvement. However, after using the BLITZ LEARNING system to study CORE and ESSENTIALS my CR grade improved over one hundred points. Not only did I improve on sentence completion, but also on CR passages and Writing sections. Practicing often seems crucial; as long as you continuously memorize the CORES and solve all the questions uploaded on the site, your grade will improve considerably. Jon’s classes were especially helpful particularly for CR passages. 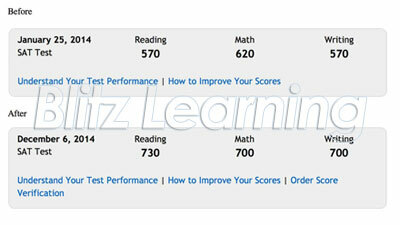 My score testifies to how great the BLITZ LEARNING system is. 말로는 BLITZ LEARNING이란 시스템이 얼마나 효율적이고 도움이 되는지 말로 다 표현하기에 턱 없이 부족하네요. 저의 SAT 점수는 BLITZ LEARNING을 쓰기 전엔 너무나도 좋지 않았습니다. 전 매일같이 3000개가 넘는 영어단어와 수백개의 기출문제들을 풀었었지만 저의 시험점수는 매번 제자리 걸음이었습니다. 막연한 수천개의 영어단어가 아닌 BLITZ LEARNING시스템이 집어 낸 핵심단어들을 공부한 후로 저의 리딩점수가 몇 백점이 올랐는지 모릅니다. 저의 문장완성 점수 뿐 아니라 독해와 라이팅 부분에서도 높은 점수가 올랐습니다. 반복연습이 얼마나 중요한 지 알았습니다. 만약 여러분도 저와 같이 핵심 영어단어들을 반복적으로 외우고, BLITZ LEARNING이 학생들에게 제공하는 기출문제들을 반복적으로 풀게된다면 저와 같은 성적향상을 기대하실 수 있을거라 생각됩니다. 제일 도움이 되었던 건 존선생님의 리딩수업이었습니다. 저의 점수향상을 보신다면 BLITZ LEARNING이 얼마나 대단한 시스템인지를 보실 수 있을겁니다. BLITZ LEARNING is unique. The thousand word core proved to be beneficial. I found the core especially beneficial when I was doing sentence completion questions because the words I studied came out in the questions. The game section was interesting too, as freebies were given out to the week’s top scorer. BLITZ LEARNING은 매우 유니크합니다. BLITZ LEARNING이 제공하는 핵심 영어단어들이 매우 중요하단 걸 실제 시험에 나오는 문장완성 문제들을 풀면서 느끼게 되었습니다. 제가 BLITZ LEARNING을 통해 공부했던 많은 영어단어들이 실제 시험에 응시하면서 정말 많은 도움이 되었습니다. 그리고 게임섹션은 공부에 지친 학생들에게 잠시나마 휴식을 줄 수 있는 아주 재미있는 기능 같습니다. 또한, 이 게임섹션은 매일 혹은 매주 고득점자들을 게임 명단에 올림과 동시에 학생들의 경쟁심을 유발하여 서로 선의의 경쟁을 치루게 되더군요. 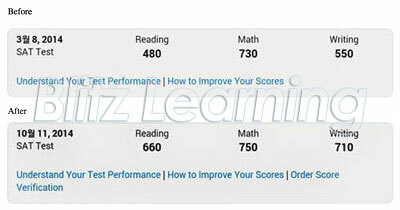 BLITZ LEARNING has been the most helpful tool in helping me obtain my SAT goals. With its frequently used vocabulary CORE system and repetition of difficult questions, I've watched my score rapidly increase. The way the questions were organized made it easy to keep track of progress and made it easy to redo the harder sections which involve harder concepts. Additionally, this program was always available to me wherever I went. The ease of access made lugging around heavy SAT review books an archaic practice. I can study when I want and where I want on any device with access to the Internet. The site provides simple and fun ways to tackle the SAT. This site is well put together. BLITZ LEARNING은 제가 SAT 목표점수에 도달하는 데 있어 가장 큰 도움을 주었습니다. 빈출 단어와 어려운 문제의 반복학습으로 인해 성적이 급격히 향상됌을 직접 확인했습니다. BLITZ LEARNING 시스템의 문제들은 저의 발전과정을 쉽게 파악시켜주었고, 어려운 개념을 포함하는 문제도 쉽게 다시 풀수 있도록 도와줬습니다. 게다가 이 프로그램은 제가 어디를 가더라도 사용할 수 있습니다. 이러한 편리한 접근성은 무거운 SAT복습 책을 들고다니며 공부하는 것이 구식이라 생각되게 만듭니다. 저는 인터넷이 연결되는 장치만 있으면 어느 곳에서나 공부할 수 있습니다. BLITZ LEARNING은 필요한 컨텐츠를 간단하고 재미있는 방식으로 제공해줍니다. 공부하기 매우 좋은 사이트입니다. 저는 SAT 공부를 시작한지 3주도 채 되지 않은 학생입니다. 영어 공부를 학교 공부 외에는 따로 한 적이 거의 없어서 처음 SAT 모의고사를 봤을 때의 성적은 매우 저조했습니다. 어휘가 심각하게 부족하다는 것을 깨달은 저는 SAT 빈출 단어집을 사서 공부를 시도했으나 며칠이 지나면 외웠던 단어를 대부분 잊게 되었습니다. 그러나 BLITZ LEARNING을 이용하여 단어를 공부한 결과 3주만에 CORE와 ESSENTIAL 1~50(1500개)에 있는 단어 대부분을 숙지할 수 있게 되었습니다. 한글로 서술된 뜻과 동의어, 관련 그림(사진), 그리고 word root가 모두 표시되어 있는 것이 기억하는데 있어 많은 도움이 되었던 것 같습니다. (개인적으로 단어가 사용된 예문도 들어가 있었으면 좋겠네요.) 또한 SAT 실전문제를 푸는 기능 역시 시간이 표시되어 있어 자신이 문제를 푸는 데 있어 소요되는 시간을 자각할 수 있어 좋습니다. Through BLITZ LEARNING’ CORE and ESSENTIAL vocabulary system, I have learned how to commit to my long term memory fundamental SAT words effectively. By providing me with crucial questions that are modeled after real SAT questions, BLITZ LEARNING taught me to quickly identify and solve questions from the downright mundane to the nefariously enigmatic. BLITZ LEARNING의 영어단어 암기 시스템으로 공부함으로써 효율적으로 장기간 영어단어 암기방법을 터득할 수 있게 되었습니다. 그리고 BLITZ LEARNING이 갖고있는 기출문제들을 통해서 어떻게하면 효율적으로 시험문제를 풀 수 있는지 배우게 되었습니다. I liked how BLITZ LEARNING broke up its questions into specific question types because most test prep books and academies mix up all the questions together which made it hard to work on specific question types. I especially like its CORE vocabulary word system. I think it is great for students who are trying to master the reading section because it uses synonyms. The use of synonyms is awesome because you can learn multiple words from just one word. 전 BLITZ LEARNING이 다른 학원들과는 차별화된 기출문제들을 사용하고 있는 걸 보고 매우 기뻤습니다. 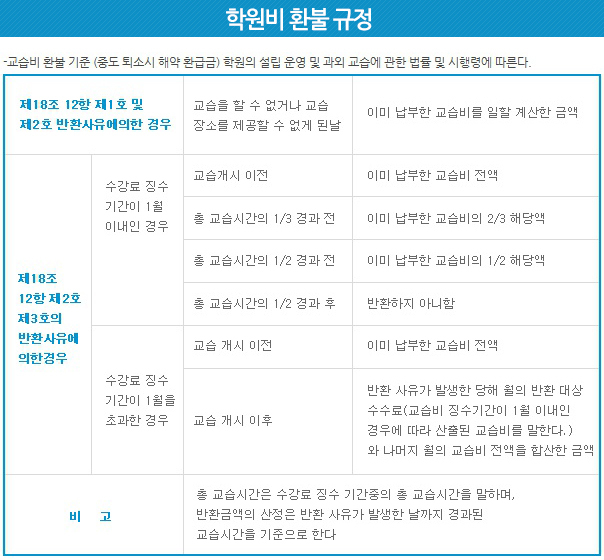 BLITZ LEARNING의 다양한 기출문제들은 아주 정확하게 세분화되어있어 학생들이 언제든지 효율적으로 공부할 수 있습니다. 저는 특히 BLITZ LEARNING의 영어단어 시스템이 제일 마음에 들었습니다. 제 생각엔 이 영어단어 시스템은 리딩섹션을 마스터하고 싶은 학생들에게 매우 도움이 될 것으로 보입니다. 동의어 시스템을 갖고 있기 때문이죠. 이 동의어 시스템을 통해 학생들은 여러 단어들을 한 단어를 통해 외울 수 있습니다. 학교에 와서 선생님이랑 공부한 것이 효과가 있다는 걸... 정말 뼈져리게 느껴요. 단어와 문법 연습이 저에게 정말 많은 도움이 되었습니다! SAT 시험에서 좋은 점수 받을게요! BLITZ LEARNING provides students with a copious amount of diverse questions and vocabularies that effectively raise students’ SAT scores . BLITZ LEARNING 시스템은 학생들에게 다양한 기출문제들과 영어단어를 제공해줌으로써 학생들이 효율적으로 성적을 올릴 수 있게 해줍니다. 환불규정 안내 | Copyright ⓒ 2015 eduasia.or.kr ALL RIGHTS RESERVED.